Nuby Spin N Teether Playful Teether | Multicolour | Helps stimulate oral development. 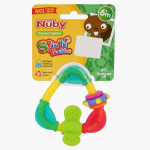 Stimulate oral development in your baby with the help of this playful teether. With multiple teething surfaces, this teether helps reduce the pain and soothes the sore gums. This BPA-free teether can be spun and shaken to keep your little one entertained. Feature 2 : Attractive color combination. Feature 1 : Helps stimulate oral development. Feature 3 : Multiple teething surfaces reduce teething pain .